Those of you that know who they are will be pretty excited to wheel on this trip with them. If you do not know them, they are a couple of full time adventurers. They do what most only dream of. Their adventure lifestyle is an inspiration to many. They came with us on a trip this year and fell in love with Baja and can not wait to get back. This will be 6 days 5 nights. All inclusive, meaning we cover everything. Logistics, meals, lodging, snacks, and beer. You only need to pay for your fuel. 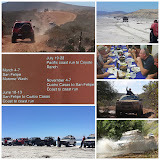 We will be covering about 750 miles of mixed dirt trails, fire roads, highway, and even some of the Baja 1000 race course. Stuart Bourdon with JP Magazine came with us on our last trip and did a writeup on his experience with us. Thank you Stu for the kind words.